One of the traditional challenges of running a small business has been dealing with the financial management tasks like accounting, payroll, bookkeeping and invoicing. Managing money is the lifeblood of a small business, but many business owners are still trying to figure out the right blend of financial management tools to keep their company running smoothly. In fact, there are still a lot of opportunities to use online tools to help save time and money when dealing with the day-to-day work of doing basic financial tasks like paying bills. For example, according to stats cited by the Wall Street Journal, businesses in the U.S. still pay half of their bills with paper checks. The costs of using paper checks are especially burdensome for small businesses. According to survey data from Dwolla, 67 percent of small businesses still issue paper checks, and it costs $7.15 to process each paper check. In fact, small businesses spend a total of $13.1 billion per year on maintaining their paper check operations. Paper checks are only one prominent example of how many small businesses could still do a lot more to integrate easy, low-cost online tools and digital processes into their business operations. Xero, a Kabbage partner, is described as “beautiful accounting software” that gives small business owners an easy, intuitive system for dealing with the day-to-day financial tasks of running your business: invoices, purchase orders, projecting cash flow, managing payroll and more. It also makes it easy to share your company’s financial data with your third-party accountant or financial advisor. Once your business has hired a few employees (or more), the complexity of financial management grows because now you have to make sure you have enough money in the bank to “make payroll” every month, as well as process payroll checks and manage withholding taxes. Gusto gives small businesses a simple, well-designed solution that enables much calmer, blissful payroll processing. The Gusto app includes features like automatic tax calculation, tax payments and tax filing; reporting new employees for tax purposes; paying contractors, setting up direct deposit and more. FreshBooks is a cloud-based accounting software solution that enables small businesses to quickly track and send invoices via email or U.S. mail. It’s a great way to avoid slow payments or unpaid bills, because it gives you great visibility into the overall status of your outstanding invoices, and it can integrate with online payment methods like PayPal, Stripe and others – no more waiting for paper checks to arrive in the mail! According to surveys, FreshBooks customers tend to get paid five days faster on average (compared to before they used the FreshBooks system) and the company’s customers tend to double their revenue (on average) within the first 24 months of using FreshBooks. Stop waiting to get paid and start sending invoices more efficiently! In the old days, it used to be expensive and time-consuming for small businesses to accept payments via credit card. In addition to the per-transaction interchange fees on every credit card payment, small businesses also had to set up a bank merchant account which often had high costs and inflexible contract terms. Fortunately, today it is easier than ever before for small business owners to take credit card payments, using tools like Square, a credit card payment processing app that works with your smartphone or tablet and has a card swiping reader that can be plugged into your headphone jack. Small business owners not only need to manage their business finances, but they have to keep a close eye on their personal finances as well. Mint is a personal finance tracking site where you can sign up to have a one-stop overview to keep track of all of your personal financial accounts – bank accounts, savings accounts, credit cards, even your home mortgage – to track your financial performance and improve your financial condition over time. Mint has tools for budgeting and does a fast, easy-to-see overview of your monthly transactions so you can see where every dollar of your money is going. Mint also gives users account alerts and custom tips for how to reduce fees and save money. The system is versatile, easy to use, fast to set up and did we mention: it’s free. (Mint makes money by recommending alternative financial services – such as lower cost banking accounts or credit cards – for its users.) Mint is owned by Intuit, a Kabbage partner. In the old days, small businesses used to be at a disadvantage because they couldn’t afford the powerful financial tools that big companies got to use – or because they couldn’t build up enough scale to find efficiencies in managing everyday tasks like payroll processing and invoicing. 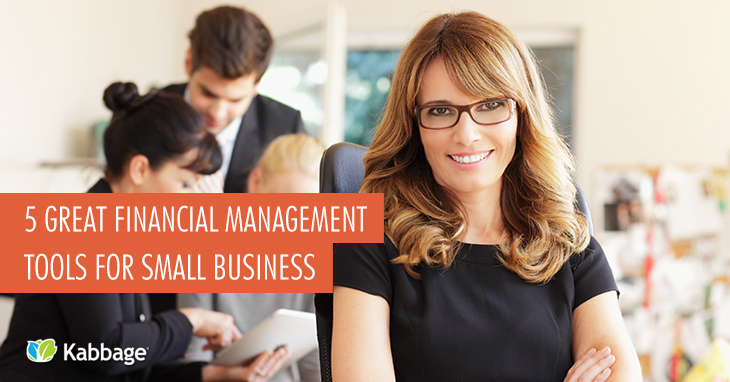 However, today, there are excellent online tools for every facet of small business financial management. It’s more possible than ever before for small businesses to get big company tools and resources at a small, affordable price – and at a small enough scale that works for the needs of their businesses.